As we usher in the New Year and slowly creep out of our holi-daze brought on by one-too-many mince pies, a little too much wine and fair bit of egg nog thrown in, it’s time to reflect on the year that was and gear up for the year that will be. If you were in manic wedding planning mode before taking that much-needed year end breather it might seem like such a drag to get back into it again. All those dreaded meetings with caterers, decorators, wedding planners, dress designers and oh-so-many-people, that you might start wishing for a time machine to take you back or catapult you forward so you can bypass the drudgery. Unfortunately time travel will remain an impossibility until modern day physicians find a way to bend the space-time continuum to do their bidding. Let’s not digress and get too technical here but rather focus on the task at hand – wedding planning. If you just cannot bring yourself to deal with any of the other arduously boring tasks then ease yourself into it by feasting your eyes on some of the best bridal looks of 2017. Each one of these is absolutely unique thanks to real brides who experimented with silhouettes, styles, embroideries and most importantly colours! It was refreshing to see brides collectively sidestepping dated reds and pinks and embracing off beat, contemporary and luscious new hues. Just like you, we are also shaking off the holiday slump so this one will be a less verbose and more visual post to help our wandering mind back into clear-headed accuracy. 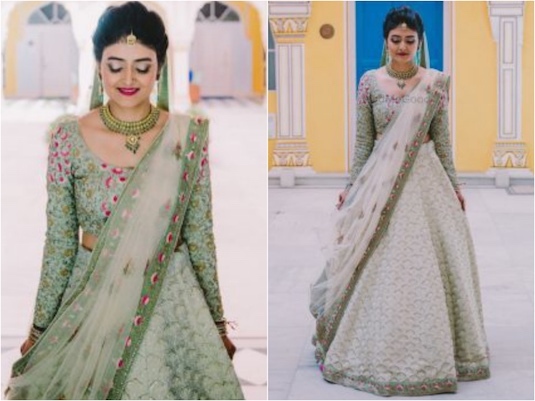 Don’t fret because we’re pretty certain that you won’t be complaining once you’ve laid eyes on these lehenga masterpieces. A single colour lehenga might sound boring to some but anyone who has played with a colour wheel can tell you than any basic colour can equal to a million different shades that compliment each other beautifully. Case in point this lehenga worn by real bride Shreya at her wedding to Vivaan. Goodbye millennial pink…….hello blush! The soft romantic shade worn all over looks straight out of a modern day fairy tale where the princess also happens to be the designer of this dreamy creation. 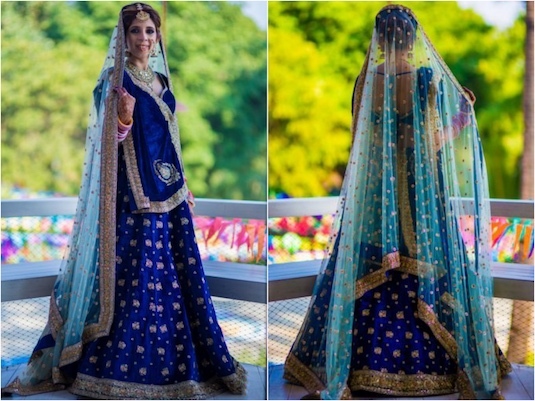 It seems fitting that real bride Natasha envisioned her own lehenga for her wedding to Sandeep and birthed it into existence through her label bZAI. If wallflower pastels aren’t for you then the juxtaposition of these bright and happy colours is sure to make your heart sing. This Sabyasachi Mukherjee creation for real bride Aanchal with its uuhhmazing blouse design must have definitely had groom Rahul swooning. If like Goldilocks, pastels are too blah and contrasting brights are too whoa! Then we have the single coloured lehenga that’s just right. Bride Sareena’s deep rich raspberry creation by Sabya (yes! he’s clearly a bridal favourite) with its lighter draped dupatta is sure to please even the most discerning. If you haven’t seen this stunner already then you’re clearly lagging behind in your Pinterest research or are just getting started. But as always, we got your back, Boo! 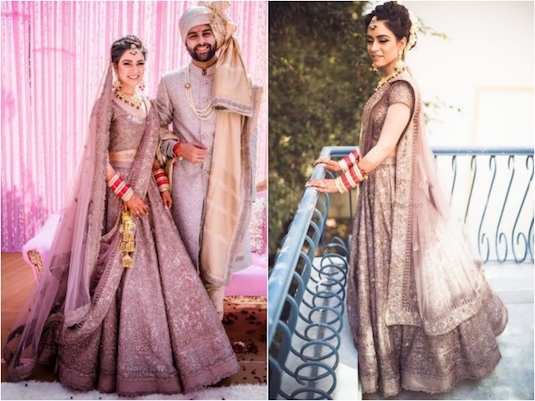 This dusty mauve embroidered lehenga with its unconventional shade had nearly broken the Internet and we have designer duo Shantanu & Nikhil to thank for it. Not only did bride Vandya give everyone a master class in #bridegoals! with her exceptional choice but groom Nikhil complimented his lady love in an lighter coloured sherwani adding the cherry atop this wedding cake. When intricate lace and delicate embellishments blend on a light lilac base in the hands of ace designer Tarun Tahiliani the result is sublime poetry. Bride Nikita looked every bit the ethereal goddess that the designer intended in his jaw dropping design. If there was any doubt about 2017 being the break out year for brides to defy convention then one need not look any further than this stunning mint green ensemble. 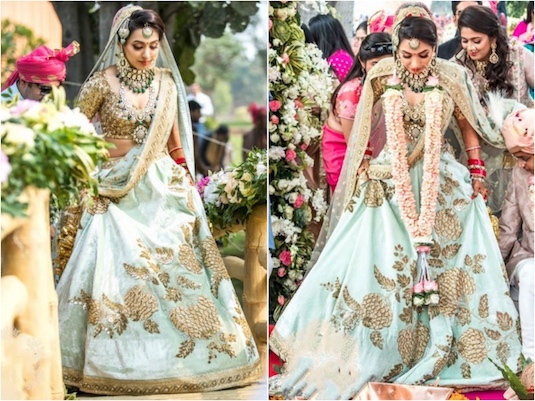 When bride Nayana wore this custom made Sabyasachi lehenga, little did she know that she was on the cusp of a massive trend as mint green is being touted as the colour du jour for all trendy brides in 2018. Colour blending is a classic Indian bridal lehenga design move that’s usually been tested out by mixing bold shades. However Anita Dongre took a decidedly unique approach when she dreamt up this seamlessly melded pastel creation for bride Tania. With so many pretty colours to choose from it’s little wonder that groom Vidhu picked from the same colour palette to match his bride. If you thought that olives only belonged in dirty martinis then you’ll be forced to think again after you’ve had your fill of this mesmerising Frontier Raas lehenga. 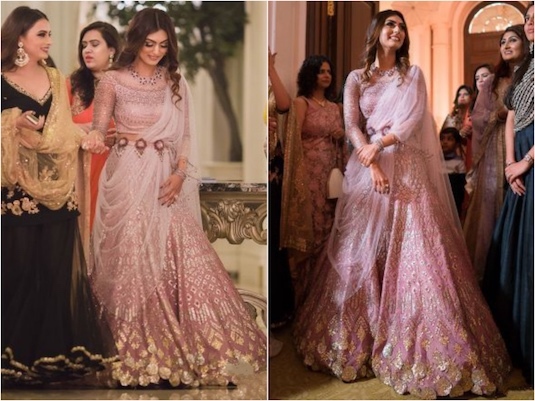 Real bride Paridhi went with this rare bridal colour peppered with pink floral embroidery for her wedding with Suparno and the effect is mind-blowing. If exclusive colours are great for all your other dos but you can’t imagine getting married in anything other than one of the traditional reds and pinks then don’t fret. 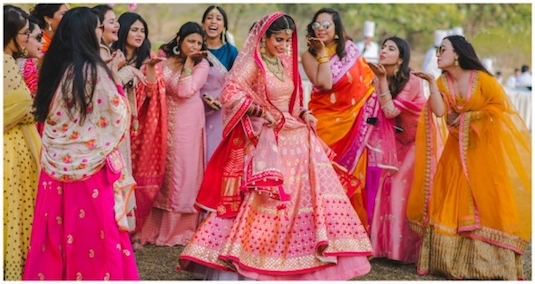 Devnaagri with their shaded pink lehenga proved that there is plenty of experimentation to be done with classic colours as well. 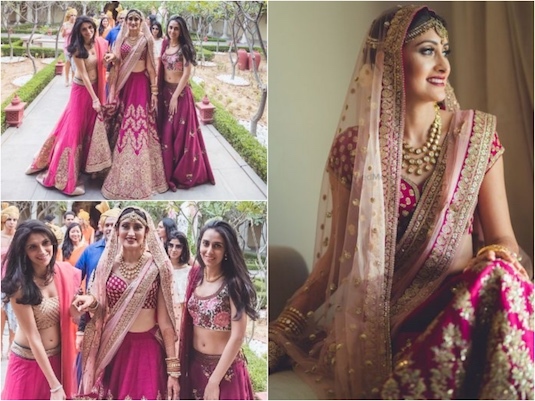 Bride Nitisha looks resplendent in a rainbow of pinks for her wedding to Yuvraj.